1- Needs to be able to shoot from Outside. 2- Smart Player, needs to be sure handed and able to run off screens and make the layup consistently. 3- Needs to be able to shoot from Outside, makes him a threat if he pops out. 4- Needs to be a good passer. 5- Will be making multiple screens, needs to be quick and assertive with body positioning. 4- Slaps ball to start play. 2- starts to drop toward the top of the 3pt arch. 3- Pops Out, pulling the defender away from the lane and looking for an open shot if available. 5-Down screens for the defender on 1, then seals if available for pass and layup. 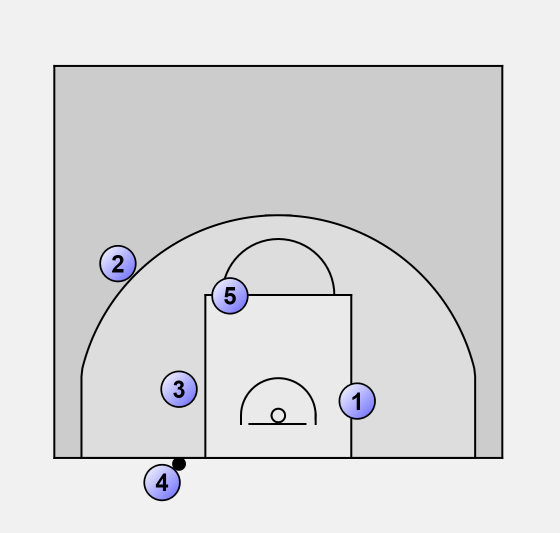 1-Goes off of Down Screen from 5, moving in the direction of 2. 1- After going off screen from 5, 1 ensues in screening for 2. 5- After screening for 1, fades towards the foul line, where he will be responsible for setting a second screen for 2. 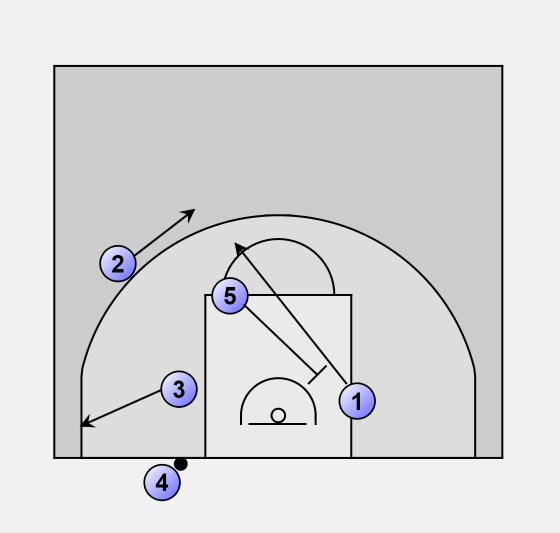 2- Uses Double screen from 1 and 5 to make cut to the basket. 3- Continues to look for pass from 4. 4- Looks for 2 coming off the 5 screen, ball fake should be used to make clear pass to the cutting 2. 2- Hightails it out of lane to the opposite side. 5- Seals and comes back to ball looking for ball and a possible layup. 3- Goes and screens for 1. 1- Uses screen from 3 to get open for 3pt shot. 1) Pass to 5 for layup. 2) Pass to 1 for 3pt shot. 3) Deep outlet to 3. 4) Timeout because 5 seconds comes fast. 4- After passing ball in, slips inbounds on opposite side of the basket. Looks for dump off from 5 if double in post.